There have been many times where I have been able to form an opinion of a Manhattan before I have taken the first sip, usually when I do this it doesn’t bode well for the drink. Often times this happens when my drink looks like a cloudy sandstorm spinning in my glass. However, in this case, I was able to form an immediate strong positive point of view for three reasons: 1)The color of the vermouth was a warmer deeper color than usual and, 2) It was clear of any particulate air bubbles – clear amber heaven, and 3) there was a proper, not emergency beacon red, dark maraschino cherry at the bottom. I knew then that the bartender Collin, at The Republic Smokehouse and Saloon, was the real deal. I called him over before my first taste and asked about the brand of Vermouth and if it was a brandied cherry. The vermouth was Carpano Antica Formula, and the cherry was not brandied, – it was just a deep black maraschino cherry. Both made a big difference. 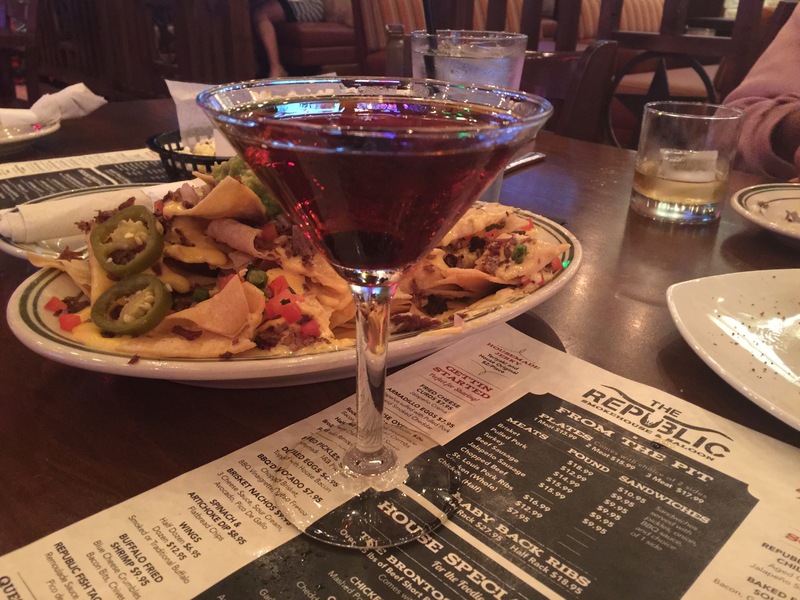 The neat Manhattan was made perfectly, albeit with the tweaks mentioned above, and I am the lucky one who was able to enjoy it. The vermouth added a deep, full bodied flavor that played very nicely with the Four Roses. I must admit, that I feel that Collin’s version is best if you are having just one. I don’t mean this as a negative statement – I simply feel it stands own its own. Thank you for the positive feedback! I consider a Manhattan to be a drink that stands alone: The experience starts with the smell, then the drink opens up on the palate as it warms, and finishes with a proper cherry. It makes me happy you could put that into words.